Guest editors: David Bryce (University of Ottawa, Canada) and Francis Taulelle (Université de Versailles Saint Quentin en Yvelines, France). The Commission on NMR Crystallography and Related Methods was established at the Montreal General Assembly in August 2014. Speakers from some relevant Microsymposia at the recent IUCr Congress in Montreal. 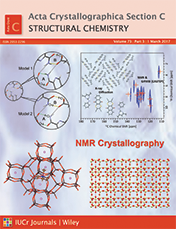 MS 73: Cross-disciplinary Investigations of Structural and Magnetic Properties of Materials by Solid State NMR and Diffraction Techniques. MS 103: Spectroscopic Approaches (XAFS, XANES, NMR, ...) in Crystallography. Masao Tabuchi (Co-Chair), Andrei Rogalev, Serena Tarantino, Joshua Kas, Charlotte Martineau, Lucia Amidani, Mikhail Soldatov, Carlo Lamberti (Co-Chair).